Harbor Research has long examined the evolution of Smart Systems in intelligent buildings. During all our time observing the space, siloed, vendor-specific solutions have always been the norm in building automation, leading to unnecessary inefficiencies for customers. In order for OEMs, service providers, and building managers to harness equipment data and derive fresh insights, innovative architectures are needed to provide users with a scalable, vendor-agnostic solution. Flexible data management, edge-to-cloud control, and comprehensive equipment coverage will be crucial to opening the door to new business models, new insights, and new streams of revenue. Harbor’s latest whitepaper, “Revolutionizing Building Management with Cloud Native Solutions,” dives into the modern world of smart building automation by examining Riptide’s Cloud-Native building management technologies and solutions. For decades, machines and various “non-intelligent” devices have been able to perform basic tasks automatically. Later, these tasks were configured to be in lock-step with other machines or people. Eventually, basic machine-to-machine (M2M) communication allowed devices to communicate information to each other, as well as to central locations where people could interact with, understand, and analyze the data to make better-informed decisions. Today, all electronic devices are becoming connected in an ever more distributed and pervasive way, enabling the convergence of physical and virtual worlds. These networks of intelligent, connected machines are the realm of Smart Systems, which is based upon a new generation of information architecture that — when combined with cloud computing, artificial intelligence, machine learning, and Internet of Things (IoT) technologies — represents a radical break from yesterday’s information, computing and telecom (ICT) paradigms. Smart Systems in the buildings sector are entering a dynamic period with emerging solutions across all segments. This will result in OEMs, technology suppliers, third party value-adders, and end-users needing to leverage, react to, and monetize emerging technologies in different ways. Building automation systems (BAS) have had remote control of equipment for decades, largely focused on efficiency gains achieved through HVAC and commercial lighting control. Today, despite an increasing amount of devices being integrated and enabled with network connectivity, OEMs and suppliers are being inhibited in unlocking the value of Smart Systems, and ultimately the value of their own devices, by viewing their opportunity too narrowly through the lens of aging business models and solution architectures. 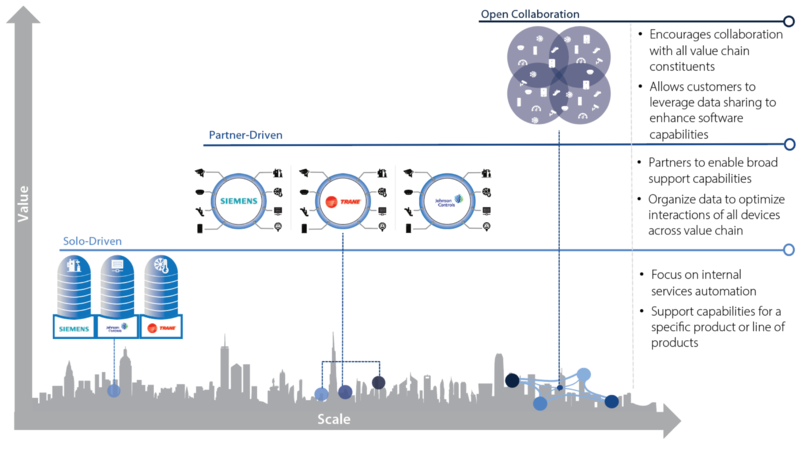 As building providers move toward Smart Systems, many are trying to do so by bundling equipment, software and services contracts without considering the need for an intricate and interoperable ecosystem. Central to this old model is the strict control of information generated by building equipment, ensuring that vendors alone are able to deliver services atop their hardware. From a technical perspective, BAS have moved from closed proprietary systems, to open standards-based architecture, to fully integrated systems. And yet most building automation leaders haven’t broken away from yesterday’s computing paradigm—on-premise systems—to embrace today’s cloud-native computing, which leverages modern application frameworks for rapid innovation, continuous delivery and superior experiences. These legacy business models and architectures have led to tangible pain points for customers. Without open and flexible data and application tools, building operators are left with several different systems to navigate before getting a holistic picture of their building operations. Additionally, these solutions are rarely scalable, which makes managing multiple sites a daunting task; they employ lax security practices, which decreases solution use and confidence; and ultimately they lack a clear vision for the future, which increases capital expenditures and time spent updating software and integrating devices. Some emerging solution providers are responding to these changing dynamics by embracing cloud-native architectures to create Smart Systems across a variety of building segments. This will simplify operations for players across the entire value chain, while also enabling use cases derived from equipment data—including energy efficiency, predictive maintenance of equipment, automated HVAC control, and any other applications that increase service provider efficiency and profitability while enhancing the end-user experience.